Scroll down to PREVIEW historic prints by Judy and George Kirchner and others. Click on the name or image for detailed information and specifications. 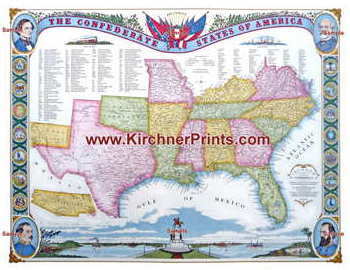 Confederate Map - 1863 / Kirchner's Map of the Confederacy depicts the Confederate States of America during the War Between the States (Civil War). The map was created by George B. Kirchner in the style of a C.S.A. cartographer-artist living in 1863. It is historically accurate and hand-drawn. The CSA Map is so reliable that one could consider it to be "The Lost Map of the Confederacy. It is the Historic First Definitive Map of the Confederate States of America. Tennessee State Capitol - 1859, Nashville is the historic antebellum Greek Ionic capitol building of Tennessee. The original print was restored and hand colored by Southern artist, Judy L. Kirchner. The architecture is Greek Ionic and designed by William Strickland. It survived the War Between the States (Civil War) and is an historical site in Tennessee. Ryman Auditorium - 1898 epitomizes Country Music in the historical former home of the Grand Ole Opry. George B. Kirchner drew the original using pen and ink and hand coloring. Steamboat captain Thomas Ryman built the Union Gospel Tabernacle for the Reverend Sam Jones after being saved at a revival. The Grand Ole Opry moved to Opryland in 1975. Union Station - Nashville - 1900 was the passenger train station for the Louisville and Nashville Railroad (L&N RR) and the Nashville, Chattanooga and St. Louis (NC&StL) Railroad. This historic depot is a favorite of train buffs and is now an historic hotel. 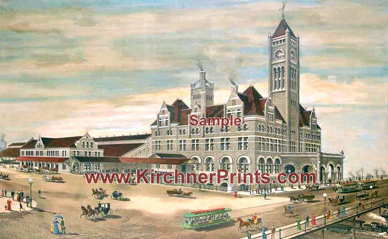 Southern artist George B. Kirchner hand-colored the original black and white antique lithograph print of Union Station. View of Nashville - 1862 depicts Nashville and the Cumberland River in the early part of the War Between the States (Civil War), showing the State Capitol in the background. Located in Middle Tennessee, the scene includes the Cumberland River and the skyline of Nashville. 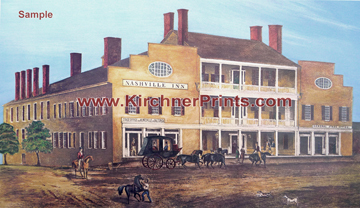 The antique print was restored and hand colored by Southern artist, Judy L. Kirchner. 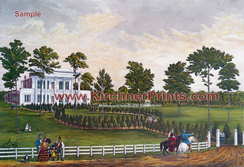 The Hermitage - Home of Andrew Jackson - 1856 was the home of President Andrew Jackson and his beloved wife, Rachel. "Old Hickory" was our Seventh President and entertained the Marquis de Lafayette at The Hermitage. The Jacksons' tomb is in the historical gardens next to the home. The antique print by F.W. Strickland was redrawn and restored by Southern Artist George B. Kirchner. Nashville Inn - 1845 was the favorite Nashville hotel of General Andrew and Rachel Jackson when they visited Nashville, a relatively long 9 mile trip in the early 1800s from their home at The Hermitage. Other guests were James Monroe, Andrew Johnson, Millard Fillmore, Martin Van Buren, John Overton, and the Marquis de Lafayette. This print was restored and hand-colored from an early antique print by southern artist Judy L. Kirchner. 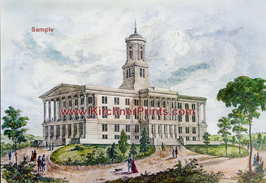 It is one of the two "Official Historical Prints" of Nashville's Century III. Steamboat on the Cumberland - 1855 at Nashville, Tennessee, shows a paddlewheel riverboat that made regular trips to New Orleans. Steam-boating was big business because Nashville was the link for Middle Tennessee to the Mississippi River and the Gulf of Mexico. This print was restored and hand-colored by Southern historical artist George B. Kirchner from an antique print. It is one of two "Official Historical Prints" for Century III. Belle Meade Deer Hunt - 1887, shows a hunt scene in Nashville, Tennessee, reminiscent of the old English Hunting Scenes. Belle Meade Farm was a world famous thoroughbred horse nursery. During the War Between the States (Civil War), the mansion was riddled with shot. The Belle Meade horse, Iroquois, became the first American bred winner of the English Derby. George B. Kirchner restored and hand colored the original antique black and white print. Andrew Jackson Bronze Statue, is from an original B.G. Smith, Jr. lithograph print of sculptor Clark Mills' equestrian statue. It shows Gen. Andrew Jackson with only the front two feet of the horse supporting the horse and rider. 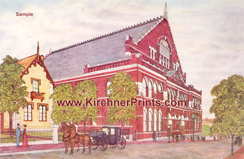 Southern historical artist Judy L. Kirchner, Nashville, TN, restored and hand colored the original print. Three identical statues were cast: State Capitol, Nashville, Tenn., Jackson Square, French Quarters, New Orleans, and next to the White House, Washington, D.C. Andrew Jackson was the seventh president of the United States. 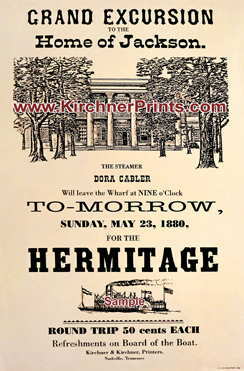 Hermitage Grand Excursion Poster is an 1880 advertisement for a steamboat ride on the Dora Cabler from Nashville, Tennessee, to The Hermitage, historic home of Andrew and Rachel Jackson. 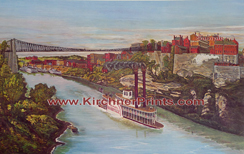 George B. Kirchner reconstructed and recreated the antique Cumberland River excursion poster. 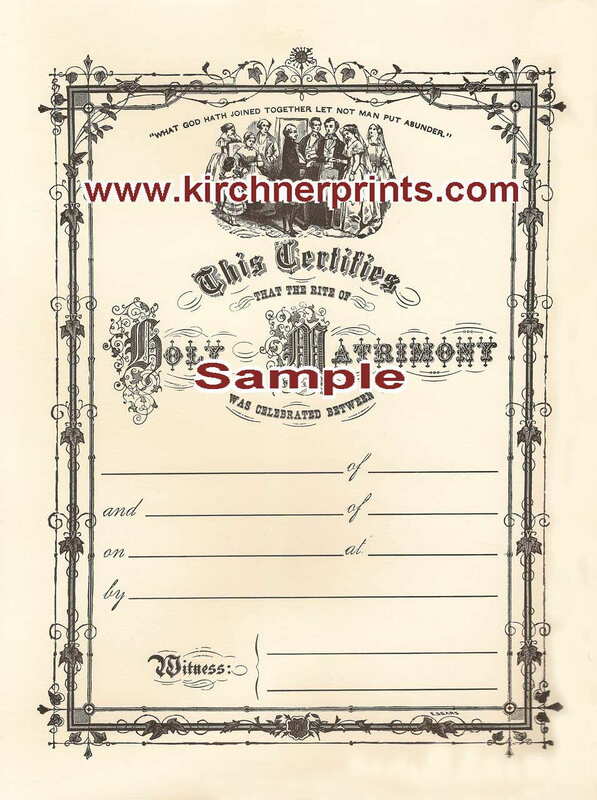 Marriage Certificate (Victorian) is a black and white reproduction of an old Victorian Marriage Certificate. 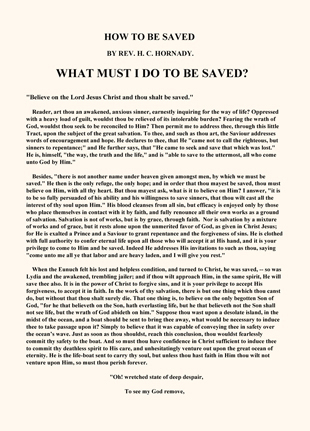 It is reproduced on off-white paper from the original document that was printed around 1885. It was restored by George B. Kirchner. Above the marriage scene at the top are the words "What God has joined together, let no man put asunder." The scene shows the parson with the bride and groom, the family, the best man and the maid of honor. It Certifies the Rite of Holy Matrimony.